Travelling in half term means your itinerary is completely flexible. You can spend one or two full days in the park, as well as a day exploring the beautiful city of Paris, which can be reached with just a short 45-minute train ride. What’s more, travelling in half term means you can choose from a range of accommodation options to suit your budget. Whilst some might prefer to stay at an official Disney hotel, the more budget conscious groups often book an off-site hotel to reduce the price without compromising any of the fun! Let us know when you want to experience the magic and we can tailor-make a trip that works for you. *Subject to location within the UK. Please note that a supplementary cost may apply. Depart the UK by coach or train and arrive at your accommodation in the evening. 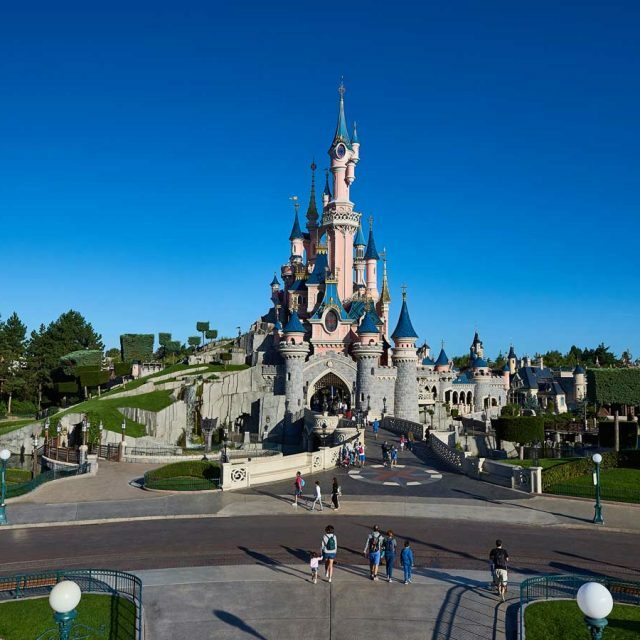 It’s time to explore Disneyland Paris and Walt Disney Studios Park! After a fun-filled day, enjoy an evening meal at Plaza Gardens Restaurants in the Disneyland Park. After breakfast, enjoy your second full day in the Disney Parks! Make sure you see Disney Stars on Parade and finish the day with an evening meal at Planet Hollywood. Be sure to shop for souvenirs in Disney Village! After breakfast at the hotel, depart by coach for a whistle-stop tour of Paris! See the capital’s cultural highlights and enjoy plenty of photo opportunities as you pass through the city, before continuing our journey home. Get a feel for the French countryside in the charming Hotel Campanile Val de France. Formerly known as the Kyriad Hotel, this lakeside hotel is perfectly situated just a few minutes away from the Disney Parks by free shuttle bus. Get back to nature at the Disney’s Davy Crockett Ranch where you’ll stay in cosy, self-catering log cabins in the heart of the great outdoors. You’ll be equipped with everything you need for the ultimate rural retreat, where adventure is right on your doorstep. Dust off your boots and yee-haw your way to the Wild West! Disney’s Hotel Cheyenne offers a true cowboy experience with all the frontier-style charm you could ask for, whilst its comfortable rooms and excellent hospitality promise a rootin’ tootin’ stay. Very helpful advice and service both on the phone and by email. All queries very promptly answered. Very efficient and friendly service. Experience the Disney© magic… time and time again!